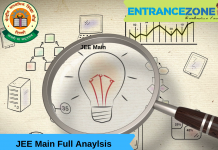 JEE Main Exam Pattern 2019 consists of two papers Joint Entrance Exam Main Paper 1 and Paper 2. So, Paper 1 is for B.E/B.Tech candidates and the JEE Main Paper 2 is for assessment of B.Arch candidates. Also, the main subjects for Paper 1 are Maths, Physics, and Chemistry. Similarly, Paper 2 will have three sections Maths, Aptitude, and Drawing. JEE main 2019 pattern changes are now officially announced and notified by CBSE. The jee main 2019 paper pattern is listed below for the candidates. 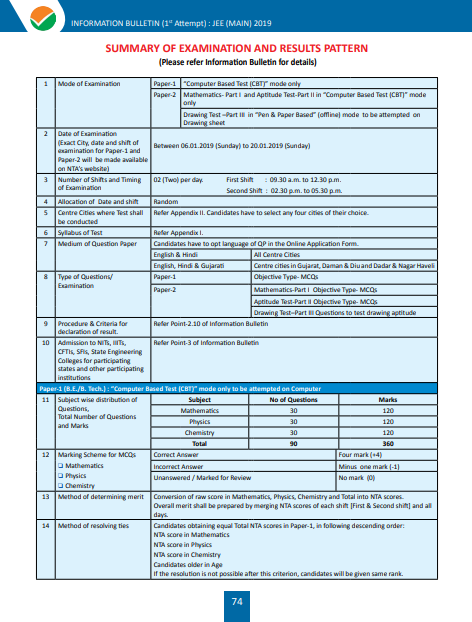 CBSE released updated information of JEE Main Exam Pattern 2019 including new exam pattern, paper analysis & JEE Main marking criteria for paper 1 & 2. This year Exam Pattern is released by IIT Kanpur. National Testing Agency will announce the New Pattern Soon, as for now there is no change in JEE Main Paper Pattern. Check JEE Main Rank Predictor Here. QWhat will be the jee main 2019 pattern? Answer: JEE (Main) – 2019 shall have two papers, Paper-1 (B. E. /B. Tech.) and Paper-2 (B. Arch. /B. Planning.). Candidates may take Paper-1 (B. E. /B. Tech. ), or Paper-2 (B. Arch. /B. Planning. ), or both as per the course(s) they are seeking admission to. Subject combinations for each paper, type of questions in each paper and mode of examination available is given in the table below. Paper- 1 (B.E./B.Tech.) Physics, Chemistry & Mathematics Objective type with equal weightage to Mathematics, Physics & Chemistry “Computer Based Test(CBT)” mode only. Questions to test drawing aptitude “Computer Based Test(CBT)” mode only. “Pen and Paper Based” (offline) mode to be attempted on Drawing Sheet. According to CBSE JEE Main Notification “CBSE/JEE/2017-18” released on 09 March 2018, The Board will use different sets of question papers on the different shifts on different dates of examination. 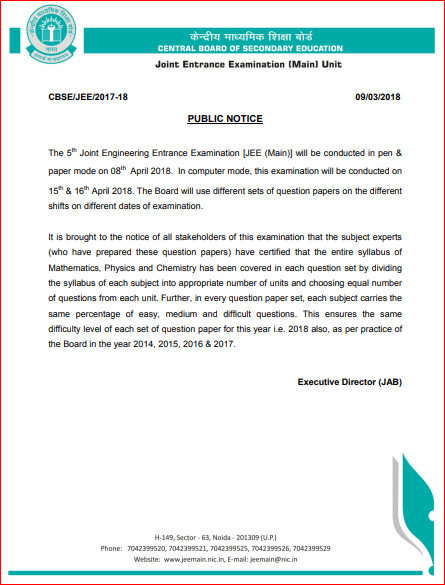 The official notification released by the Executive Director (JAB) CBSE regarding the use of different sets of question papers on the different shift on different dates of examination. IIT JEE 2019 pattern is the same as before, few changes are incorporated last year in ranking are listed below. keep watching this page for any new changes. 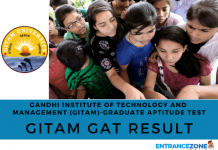 The criteria for admissions of the candidates to Undergraduate Engineering Programs at National Institutes of Technology (NITs), Indian Institutes of Information Technology (IIITs), Other Centrally Funded Technical Institutions (CFTIs), Institutions Funded by Participating State Governments, and Other Institutions will include the performance of candidates in 10 + 2 or equivalent Qualifying Examination, and in JEE Main 2019 Examination. Paper 1 (B.E. / B. Tech.) of JEE Main 2019 Examination will be the qualifying examination for JEE Advanced 2019, which the aspirants must take who are willing to take admissions in Undergraduate Engineering Programs at Indian Institutes of Technology (IITs). Also, the states of Gujarat, Madhya Pradesh, Nagaland, and Odisha have joined the JEE Main System. So, the candidates willing to take admissions in the institutions located in these states need to appear for JEE Main 2019 Examination because there is no State Level Engineering Entrance Examination as it was before. The mode of examination is announced by National Testing Agency in JEE Main Information Brochure. 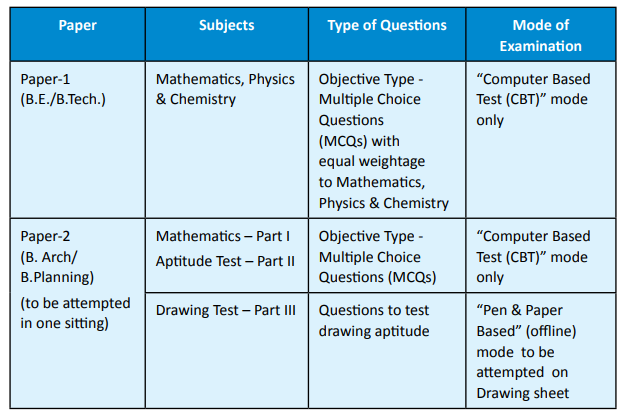 There will be two separate modes of JEE Main for Paper 1 (B.E. / B. Tech. ), i.e., Offline Mode (Pen and Paper Examination) and Online Mode (Computer Based Examination). There will be the only single mode of JEE Main for Paper 2 (B. Arch. / B. Planning), i.e., Offline Mode (Pen and Paper Examination). The two different modes of examination, i.e., Offline Mode (Pen and Paper Examination) and Online Mode (Computer Based Examination) will be available for Paper 1 (B.E. / B. Tech.) of JEE Mains. The candidates cannot use any type of electronic devices in the Examination. Study materials such as Book, Note Book, Log Table, etc. is not permissible inside the examination hall. The JEE Main Exam Pattern 2019 or paper pattern for both the papers is given below. Basically, the Joint Entrance Examination is conducted for two paper. Paper 1 is for B.Tech Aspirants and Paper 2 is for B.Arch aspirants. Paper 1 Pattern: JEE Main Exam Pattern 2019 for Paper 1 will contain questions from the three subjects. Also, there will be a total of 90 Objective questions. Moreover, uniform weightage to all subjects is available. Further, a total of 30 questions will be asked about every subject. 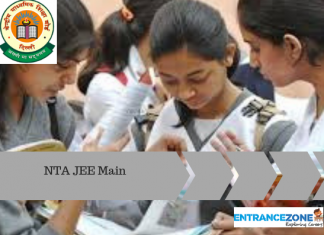 NTA has announced the JEE Main 2019 shall have two papers, Paper-1 (B. E. /B. Tech.) and Paper-2 (B. Arch. /B.Planning). Students may take Paper-1 (B. E. /B. Tech. ), or Paper-2 (B. Arch. /B.Planning. ), or both as per the course(s) they are interested in. Marking Scheme 4 marks will be awarded for every correct response; for the incorrect response, 1 mark will be deducted. No marks will be given for unattempted questions. JEE Main 2019 will take place in major cities/towns of India as well as abroad. During the application, the applicants have the option to select four examination centre cities as per their preferences for Offline (Pen and Paper Based) Examination. But, the applicants will have the option to select just one examination centre city for Online (Computer Based) Examination. If the number of candidates in a particular city is less than 50 on a particular date, then candidates will get the last day of the Online (Computer Based) Examination in the same city. Also, full efforts will be made to give the examination city as per their preferences for Offline (Pen and Paper Based) Examination. But, under certain circumstances, the candidates may get some different city in the nearby area. But, the requests for change of examination centre will not be entertained and the decision of the Executive Director (JAB) will be final in this regard. JEE Main Instructions for Candidates Appearing in the Examination. Code of Conduct for Candidates During JEE Main 2019. The candidates need to maintain perfect silence and attend their question paper only. Any type of conversation/disturbance/gesture in Examination Hall will be considered as misbehaviour. In case any candidate uses Un-Fair Means (UFM), then his / her candidature will be rejected and he/she will be debarred from taking the examination permanently / temporarily depending on the nature of candidate’s offence. Any type of electronic devices or study materials is not permissible inside the Examination Hall. If any candidates are possessing any such items, then he/she will be considered as using Un-Fair Means (UFM), his/her current examination will be cancelled, he/she will be debarred from future examination(s), and the equipment will be seized. Removing any page from one’s test booklet will also come under Un-Fair Means (UFM) and he/she will be liable for criminal action. JEE Main Exam Pattern 2019: The Ministry of Human Resource and Development (MHRD) have dropped the weightage of class 12th board exams in Jee Mains 2019 rank. Paper 2 will contain three sections: mathematics, aptitude and drawing test. And, this paper will comprise of 82 questions in total. 50 for aptitude test, 2 questions for drawing test and 30 questions from Maths. Paper 1 comprises of 90 questions in total; 30 each from Maths, Physics, and Chemistry. Also, Paper 2 includes 82 questions and Each Question will carry 4 marks for the right response. And 2 drawing questions contain 70 marks in total. Also, Negative marking of 0.25 marks is applicable to each incorrect answer in the OMR sheet. 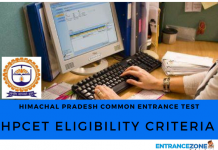 Note: Under no circumstances, the choice of cities for Centre, Date, Shift and Paper (Paper-1 or Paper-2) provided in the Admit Card shall be changed. The National Testing Agency published the Summary of JEE Main Examination and Result Pattern in JEE Main Information Brochure. Finally, “Stay informed about EntranceZone Latest updates and feature articles regarding JEE Main exam pattern 2019“. , iit jee 2019 pattern. How can I improve my Aptitude section? From where to get last 10 year question paper? What are points that need to be iprove for the aptitude section? ?